It is important that expecting mothers eat healthy when they are pregnant to ensure that their baby gets the nutrients and calories it needs to grow healthy and strong. 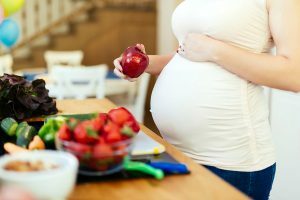 Eating healthy when pregnant will also mean that you will put on a lot less weight and find it easier to bounce back postpartum. Here are some tips on what you should be eating. Folate – Folate is found in green leafy veggies, legumes, and asparagus, which reduces neural-tube defects by 70%. Although most gynecologists will prescribe a folate and iron supplement, look at getting more iron from natural sources like the above. Make sure you don’t take your iron supplement, straight before you consume dairy or a calcium supplement, as this will reduce iron and calcium absorption. Calcium – Getting sufficient calcium will prevent you, baby, absorbing calcium from your reserves. Look at drinking a glass of milk, cheese, and yogurt every day, to get more calcium from your food. If you are lactose intolerant, look at consuming lactose-free milk or a calcium supplement. Omega-3s – Omega-3 fatty acids are great for your baby’s brain and eye development. Healthy DHA’s will also reduce your risk of prematurity. Look at adding oily fish like salmon coupled with nuts, leafy greens, and DHA-fortified eggs. Water – Staying hydrated when you are pregnant is vital as this mean that you will feel less tired and your body will be able to grow correctly. Drink a minimum of eight glasses a day and increase this quantity if you are in hot, humid weather or you are exercising. If you are looking for a pediatrician, you may be wondering where to start.